Fabtech's 6" Performance System features specially valved extended length front shocks that utilize the stock coil springs for a factory like ride. Massive extended length cast steering knuckles attach to high arched lower control arm crossmembers for superior strength. A 1/4" thick steel skid plate protects the front differential. 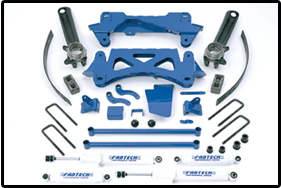 Included in this system includes preinstalled wheel bearings, seals and ball joints for a quick installation. - Precision hydraulic press work required. This product ships truck freight due to the high weight of the item. Please add item to cart for shipping cost or contact us for a quote.